Cruise to the Goolwa Barrage, through the lock, across the Murray Mouth into the Coorong National Park. At Barkers Knoll take a guided walk through dune vegetation to a Southern Ocean beach. Lunch on board cruising into the Coorong before mooring among the sand dunes at beautiful Cattle Point. Another guided walk to visit a significant old aboriginal midden site. Enjoy afternoon tea while cruising back to Goolwa. Please "Check In" at our Main Wharf, Goolwa Office, 15 mins prior to departure time. Boarding will commence approximately 15 minutes prior to departure time. WHAT TO BRING: Comfortable walking shoes, hat and sunscreen, jacket, camera, binoculars (if you have them and want to maximise viewing of birdlife), extra drinks (if you would like). We'd love to have you aboard one of our Spirit of the Coorong Cruises. If you'd like to join us, it's important to book so you don't miss out! Booking online is easy and if your plans change, simply call us to move your booking to a different date (subject to 48 hours notice given & availability). If you would like any assistance to book your cruise, please contact our friendly office staff on 1800 442 203 or (08) 8555 2203. A 3.5 hr Cruise departing Goolwa Wharf. Cruise through the Barrage, across the Murray Mouth & approx. 12 kms into the Coorong National Park. Includes: 1 guided walk, lunch & afternoon tea. GIFT VOUCHERS may be purchased for this cruise. Lunch is served on board as you cruise to the Goolwa Barrage and through the lock. Continue cruising down to the Murray Mouth and into the Coorong National Park. Stop for a guided walk across the peninsula through dune vegetation to a beach on the Southern Ocean. Afternoon tea is served cruising back towards the lock at Goolwa. Pick up from Adelaide CBD to Goolwa, 3.5 hr Cruise departing Goolwa Wharf. 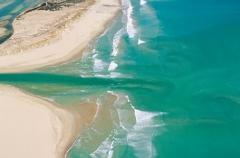 Cruise through the Barrage, across the Murray Mouth & into the Coorong National Park. Includes: 1 guided walk, lunch & afternoon tea. Return transfer to Adelaide. TRANSPORT from Adelaide CBD (selected pick up points only). If your location is not on the pick up list, you will need to phone the office for directions to your nearest pick up point. Transfers from/to Adelaide CBD need to be booked no later than 5pm on the day prior to this cruise. We require a minimum number of booked passengers for the CBD transfers to run. If in the event this requirement is not met, passengers requiring transfers will be offered a rescheduled cruise or a full refund. Please "Check In" at our Main Wharf, Goolwa Office, 30 mins prior to departure time. Boarding will commence approximately 15 minutes prior to departure time. WHAT TO BRING: Comfortable walking shoes, hat and sunscreen, jacket, camera, binoculars (if you have them and want to maximise viewing of bird life), extra drinks (if you would like). Cruise to the Goolwa Barrage, through the lock, and down to the Murray Mouth. An opportunity for a short walk at the Murray Mouth before cruising back through the lock to Goolwa. No meals or drinks are included on this cruise. 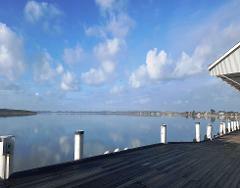 Please "Check In" at our Main Wharf, Goolwa Office, 15 mins prior to departure time. Boarding will commence approximately 15 minutes prior to departure time. From the Riverport of Goolwa board "Spirit of the Coorong", cruise 42kms through the Coorong National Park to Long Point. Coach transfer to Meningie. Then board "Spirit of the Murray" & cruise 65kms through the Lower Lakes back to Goolwa. Board either Spirit of the Coorong or Spirit of the Murray at 10.00am, from the Historic Goolwa Wharf to begin your Lower Lakes and Coorong Experience. Travelling upstream you will view the Goolwa and Hindmarsh Island waterfront whilst passing the Lower Murray tributaries of Currency Creek and Finniss River. Continuing upstream we pass the township of Clayton Bay and the private islands: Goose, Goat and Rat Islands. We head past Point Sturt into Lake Alexandrina, Australias largest freshwater lake, at Point Mcleay view (from the water) the first Aboriginal Mission in Australia “Raukkan”. We then pass the Historic Point Malcolm Lighthouse and the township of Narrung as we enter the “Narrows” which join Lake Alexandrina and Lake Albert. We then cross Lake Albert to Meningie and board our coach to travel the short 25 kms by land to Long Point on the Coorong. At Long Point, board our “Spirit of the Coorong” and cruise through the Coorong National Park. Head towards the Murray Mouth, passing the barrages Tauwitchere and Ewe Island. Then onto the old fishing village of “Sleep Hollow”. Continue cruising passing by Mundoo Channel and to the mouth of the Mighty Murray River, where you will hear the tragic history of this iconic site. We continue past the mouth into the lock of the Goolwa Barrage and return to the departure point The Goolwa Wharf at approx 4pm. Please note that the tour operates in reverse and some passengers will depart the Goolwa Wharf and travel into the Coorong first. Morning tea, lunch and afternoon tea are included during the cruise and the captain provides an informative commentary throughout the day. Coach Transfer between 2 boats. WHAT TO BRING: Comfortable walking shoes, hat and sunscreen, jacket, camera, binoculars (if you have them and want to maximise viewing of birdlife). We'd love to have you aboard one of our Spirit of the Coorong Cruises. If you'd like to join us, it's important to book so you don't miss out! Cruise to the Goolwa Barrage, through the lock, across the Murray Mouth into the Coorong National Park. At Godfreys Landing take a guided walk through dune vegetation to a Southern Ocean beach. Lunch on board cruising into the Coorong before mooring among the sand dunes at beautiful Cattle Point. Another guided walk to visit a significant old aboriginal midden site. Enjoy afternoon tea while cruising back to Goolwa. Gift Vouchers are the perfect present for that person who has everything. Purchase a Gift Voucher as a birthday present, Christmas present, anniversary present, Mother's Day present, Father's Day present, Employee of the Month award, Thank You Gift, Award, or any special occasion. Gift Vouchers are valid for 36 months from the date of purchase. A Gift Voucher cannot be refunded, redeemed or exchanged for cash. A Gift Voucher is only valid for the cruise you have selected. Cruise times, dates and availability are listed on our website. Gift Vouchers may be upgraded by the recipient at the time of booking (if applicable). Bookings are to be made by the recipient. We must know number of all passengers on board, therefore please include all passengers in your booking, including "Child Under 2" for which there is no charge. Please note - Meals are not included for children under the age of 2. If your child is under the age of 2, and you would like a meal for the child, you will need to book and pay for a "Child (2-15 years)" Ticket. We require all Passengers to be sufficiently mobile to negotiate stairs and generally move about the vessel. If you would like any assistance with the purchase of your Gift Voucher, please contact our friendly office staff on 1800 442 203 or (08) 8555 2203. Enjoy our 3.5 hour "Coorong Discovery Cruise", which includes: Lunch, Arvo Tea & 1 guided walk. Enjoy our 2 hour "Murray Mouth Cruise", to the mouth of the Murray River. No meals/drinks included on this cruise.